The Texas Longhorns have been playing football since 1893 and have won 4 national titles (1963, 1969, 1970 and 2005) in the past 50 years, 32 conference titles, posted an all-time winning record of 858-330-33 (.716), posted an all-time postseason record of 26-22-2 (.541) and housed 2 Heisman Trophy winners. Football in Texas has become a highly honored tradition and a Texas Longhorns championship ring is just about important to fans as a cool-glass of water on a dry and hot summer day. The 1963 Longhorns posted an 11-0 record that season and went on to defeat the #2 Navy in the Cotton Bowl by a score of 28-6, winning their first national title. In 1969, the Longhorns posted another 11-0 record. The final game of the season pitted the Longhorns against Arkansas and was titled the “Game of the Century.” The game was considered to give Texas the national championship, even before they faced Notre Dame at the Cotton Bowl, whom of which they defeated 21-17. That game was also the Longhorns 20th consecutive win at the time. They went on to win 30 consecutive games and capture the national title in 1970, but lost the Cotton Bowl that year to Notre Dame by a score of 24-11, officially breaking their winning streak. It would be another 25 years before the Texas would bring home another championship ring, but sure enough, the 2005 season happened. After going 13-0 in the regular season, Texas went on to face the USC Trojans at the Rose Bowl for the BCS National Championship Game. Texas won the game 41-38 for their 4th national championship. 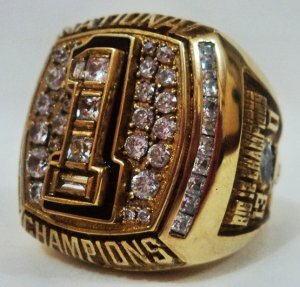 Replicas of the 2005 Longhorns championship ring have sold on eBay between $22.50 and $220. One ring is solid brass with polished 18K gold plating. The AAA CZ’s are prong set and it weighs 40 grams. Most came in multiple sizes.